Every time she plays, Japanese pianist Eri Yamamoto seeks to paint an aural picture. 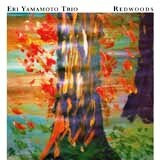 Redwoods, Yamamoto's fifth release with her long standing trio (though the first on Aum Fidelity), constitutes an inviting and engaging gallery. It follows hot on the heels of her warmly acclaimed series of duets, Duologue (2008), and her soulful contribution to William Parker's outstanding Cornmeal Dance (2007), both on the same label. After a Damascene conversion to jazz following exposure to Tommy Flanagan during a visit to New York, the classically trained Yamamoto studied at the New School with bassist Reggie Workman and gigged regularly, becoming a fixture at Arthur's Tavern in Greenwich Village since 2000. At her side the whole time has been compatriot Ikuo Takeuchi on drums, while for the last four years David Ambrosio has filled the bass chair. Together they forge a tight but airy group identity, elegantly solving the conundrums posed by Yamamoto's rhythmically charged themes. Backing such a strong pianist, Takeuchi is able to avoid the constraints of explicit time keeping for a discreetly free-ish pulse, obliquely embellishing the tripping flow. Ambrosio anchors the trio with warmly resonant bass and lilting solo expositions. With her churchy chording, rhythmic invention and bluesy edge, Yamamoto sometimes evokes early Dollar Brand (now Abdullah Ibrahim), while nonetheless retaining a rich melodic bent all her own. From the rolling locomotion of the opener, "This Is An Apple," to the celebratory joy of the concluding "Dear Friends," the trio cook up a confection of blossoming dialogue and rhythmic intrigue. Whether negotiating the involved tumbling line of "Bumpy Trail," countering the stop start theme of "Bottled Water Princess" with a bop-ish release, or ruminating on the wistful ballad of the title track, they are consistently alert to each other and yet still at the service of Yamamoto's pictorial ambitions. With such vibrant portrayals, this disc affirms Yamamoto's place as a rising talent in the pianistic pantheon.